Remember that it will take time to adjust to the feel of your new bite. When the bite is altered or the position of the teeth is changed it takes several days for the brain to recognize the new position of your teeth or their thickness as normal. If you continue to detect any high spots or problems with your bite, call our office at Fairfax Office Phone Number 703-884-2414 so we can schedule an adjustment appointment. Occasionally a temporary crown may come off. Call us at Fairfax Office Phone Number 703-884-2414 if this happens and bring the temporary crown with you so we can re-cement it. It is very important for the temporary to stay in place, as it will prevent other teeth from moving and compromising the fit of your final restoration. If your bite feels uneven, if you have persistent pain, or if you have any other questions or concerns, please call our office ☎ Fairfax Office Phone Number 703-884-2414. Use the pain medication as directed. Call the office at Fairfax Office Phone Number 703-884-2414 if the medication doesn’t seem to be working. If antibiotics are prescribed, continue to take them for the indicated length of time, even if signs and symptoms of infection are gone. Drink lots of fluid and eat nutritious soft food on the day of the extraction. You can eat normally as soon as you are comfortable. After a few days you will feel fine and can resume your normal activities. If you have heavy bleeding, severe pain, continued swelling for 2-3 days, or a reaction to the medication, call our office immediately at Fairfax Office Phone Number 703-884-2414. It is normal to experience some hot, cold and pressure sensitivity after your appointment. Injection sites may also be sore. Ibuprofen (Motrin), Tylenol or aspirin (one tablet every 3-4 hours as needed for pain) work well to alleviate the tenderness. If pressure sensitivity persists beyond a few days or if the sensitivity to hot or cold increases, contact our office at Fairfax Office Phone Number 703-884-2414. If your bite feels uneven, if you have persistent pain, or if you have any other questions or concerns, please call our office at Fairfax Office Phone Number 703-884-2414. The placement of a dental implant can be very simple or may be complicated depending on the circumstances of your case. Postoperative care is very important. Unnecessary pain and the complications of infection and swelling can be minimized if the instructions are followed carefully. There may be a metal healing abutment protruding through the gingival (gum) tissue at the implant site. It should be cleaned just like a tooth. You must be careful not to chew on the implant during the entire healing phase until the tooth is placed on the implant. Bite on the gauze pad placed over the surgical site for an hour. After this time, the gauze pad should be removed and discarded and replaced by another gauze pad. Refer to the section on BLEEDING for specific details. To minimize any swelling, place ice packs to the sides of your face where surgery was performed. Refer to the section on SWELLING for explanation. Take the prescribed pain medications as soon as you can so it is digested before the local anesthetic has worn off. Having something of substance in the stomach to coat the stomach will help minimize nausea from the pain medications. Refer to the section on PAIN for specific details. Restrict your activities the day of surgery and resume normal activity when you feel comfortable. If you are active, your heart will be beating harder and you can expect excessive bleeding and throbbing from the wound. Generally there is much less bleeding with implants than tooth extractions because the implant fills the hole created in the bone. There is no open extraction site where a clot must form. Biting on gauze is still important for 6-10 hours after surgery. The pressure keeps the adjacent gum pushed tightly against the bone and that minimizes bleeding under the gum around the implants. Some bleeding or redness in the saliva is normal for 24 hours. Excessive bleeding (your mouth fills up rapidly with blood) can be controlled by biting on gauze placed directly on the bleeding wound for 60 minutes. Repeat as needed every hour for 6-8 hours. If bleeding persists please call our office for further instructions. Placement of a dental implant generally does not produce much swelling so it may not be necessary to use ice at all. If there was a fair amount of cheek retraction involved with your implant procedure, then it would be appropriate to apply ice on the outside of the face on the affected side. The swelling will not become apparent until the day following surgery and will not reach its maximum until 2-3 days post-operatively. The swelling may be minimized by the immediate use of ice packs. Sealed plastic bags filled with ice, ice packs, or a bag of frozen peas or corn wrapped in a washcloth should be applied to the side of the face where surgery was performed. The ice packs should be applied 20 minutes on/20 minutes off for the afternoon and evening immediately following your extraction. After 24 hours, ice has no beneficial effect. Bright red, rock hard, hot swelling that does not indent with finger pressure, which is getting bigger by the hour, would suggest an infection. This usually would develop around day 3-4 after surgery when you would expect swelling to be going down, not up. If this should occur, please call the office. It is normal to run a low-grade temperature (99-100F) for 7-10 days following oral surgery. This reflects your immune response to the normal bacteria that are present in your mouth. A high temperature (>101F) might exist for 6-8 hours after surgery but no more than that. 2 Tylenol or 2-4 Ibuprofen every 4-6 hours will help to moderate a temperature. A temperature >101F, several days after surgery, especially if accompanied by rock hard swelling and increased pain, is usually indicative of an infection. You should call the office for instructions if this should occur. Pain or discomfort following surgery may last up to 4-5 days. For most patients, it seems they rely mainly on Tylenol or Ibuprofen by the second day. Many medications for pain can cause nausea or vomiting. It is wise to have something of substance in the stomach (yogurt, ice cream, pudding or apple sauce) before taking prescription pain medicines and/or over the counter pain medicines (especially aspirin or ibuprofen). Even coating the stomach with Pepto Bismol or Milk of Magnesia can help prevent or moderate nausea. Moderate pain: 1 or 2 tablets of Tylenol or Extra Strength Tylenol may be taken every 3-4 hours, or 2-4 tablets of 200 mg Ibuprofen (Motrin or Advil) may be taken every 3-4 hours. Severe pain: take the tablets prescribed for pain, as directed, every 4 hours. The prescribed pain medicine will make you groggy and will slow down your reflexes. Do not drive an automobile or work around or operate heavy machinery if you are taking prescription pain medicine. Alcohol and prescription pain medicines do not mix! Be sure to take the prescribed antibiotics as directed until they are completely gone, regardless of how good you may feel to help prevent infection. Chew where your natural teeth are and not on the dental implant throughout the whole healing phase. Drink plenty of fluids. Try to drink 5-6 eight-ounce glasses the first day. Soft food and liquids can be eaten on the day of surgery. 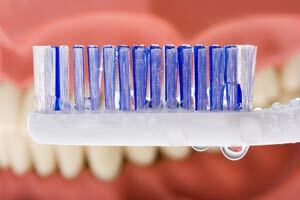 Brushing your teeth and the healing abutments is no problem. Be gentle initially with brushing the surgical areas but do not avoid them. Warm saltwater rinses (teaspoon of salt in a cup of warm water) or plain water should be used at least 4-5 times a day especially after meals, starting the day after surgery. In some cases you will be instructed use the prescribed Peridex Oral Rinse before bed. The day after surgery, the Peridex should be used twice daily, after breakfast and before bed. Be sure to rinse for at least 30 seconds then spit it out. Smoking retards healing dramatically. Nicotine constricts blood vessels, which slows the healing of surgery sites and affects the long-term health of the gum and bone. Smoking and dental implants do not mix. There is a documented increased failure rate of implants in patients who smoke. Therefore, the implant companies will not honor any of the replacement warranties on implants in patients who smoke. If you choose to smoke, you do so at the risk of losing your dental implants due to poor healing and increased gum disease in smokers. Partial dentures, flippers, or full dentures should not be used immediately after surgery. Biting directly on the gauze will stop bleeding faster and prevent bleeding under the gums around the implant. It is recommended that a prosthesis not be worn for at least 2 weeks. In all cases you should remember that the prosthesis is for esthetics only and not for vigorous chewing. You want to minimize vigorous chewing of any kind on the healing cap or over the submerged implants during the entire healing phase. If you have any other questions or concerns, please call our office at Fairfax Office Phone Number 703-884-2414. A sinus lift is a very delicate procedure performed if the area in the upper jaw that you are to have an implant(s) currently has insufficient bone because of an enlarged sinus. This procedure will augment the deficient area in the maxillary sinus. The bone that is being grafted will most commonly be coming from freeze-dried bone and artificial synthetic bone. Sometimes the implant is placed at the same time as the graft, other times the implant will be placed at a later date. Whichever method is utilized, the postoperative instructions will be the same. In addition to the Implant Surgery postoperative instructions, please follow the instructions below as accurately as possible. Smoking dramatically decreases the body’s healing potential, especially in the sinuses. Please do not smoke for 3 weeks following sinus surgery. Most importantly, do not blow your nose as this can dislodge the graft. If you have a runny nose, wipe it as necessary. Also, try not to sneeze. If you must sneeze, open your mouth to decrease the amount of pressure applied to the nose and sinus. Do not drink through a straw or rinse forcefully as these actions can cause bleeding at the intraoral surgical site. When sleeping, elevate your head to avoid excess pressure in the sinus. Avoid strenuous activity or heavy lifting for 10-14 days. Follow all other post-operative instruction as listed under AFTER IMPLANT SURGERY. Most dental insurance policies provide coverage for new dentures every five years.